In a quantum dot, there are both negatively charged particles and positively charged particles that are missing electrons (also referred to as holes). The attraction between the electron and hole creates a new quantum state with a very strong light-matter interaction and a corresponding quick release of light. All light sources work by absorbing energy – for example, from an electric current – and emit energy as light. But the energy can also be lost as heat and it is therefore important that the light sources emit the light as quickly as possible, before the energy is lost as heat. Superfast light sources can be used, for example, in laser lights, LED lights and in single-photon light sources for quantum technology. New research results from the Niels Bohr Institute show that light sources can be made much faster by using a principle that was predicted theoretically in 1954. The results are published in the scientific journal, Physical Review Letters. Researchers at the Niels Bohr Institute are working with quantum dots, which are a kind of artificial atom that can be incorporated into optical chips. In a quantum dot, an electron can be excited (i.e. jump up), for example, by shining a light on it with a laser and the electron leaves a 'hole'. The stronger the interaction between light and matter, the faster the electron decays back into the hole and the faster the light is emitted. But the interaction between light and matter is naturally very weak and it makes the light sources very slow to emit light and this can reduce energy efficiency. Already in 1954, the physicist Robert Dicke predicted that the interaction between light and matter could be increased by having a number of atoms that 'share' the excited state in a quantum superposition. Demonstrating this effect has been challinging so far because the atoms either come so close together that they bump into each other or they are so far apart that the quantum speed up does not work. 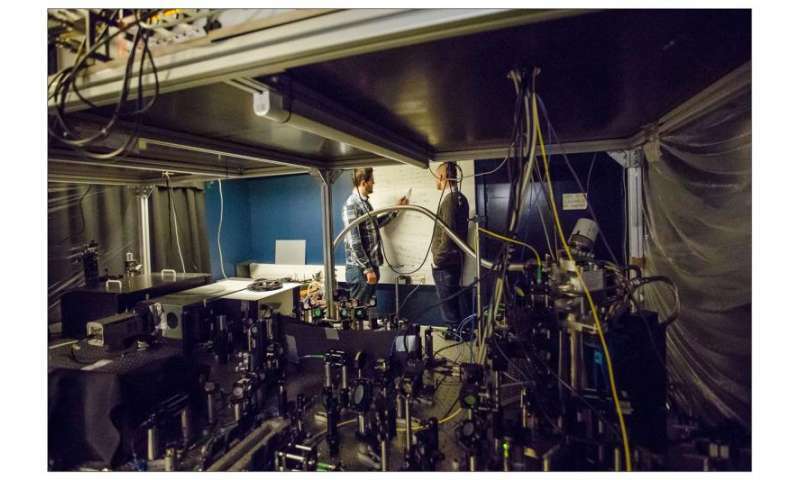 Researchers at the Niels Bohr Institute have now finally demonstrated the effect experimentally, but in an entirely different physical system than Dicke had in mind. They have shown this so-called superradiance for photons emitted from a single quantum dot. "We have developed a quantum dot so that it behaves as if it was comprised of five quantum dots, which means that the light is five times stronger. This is due to the attraction between the electron and the hole. But what is special is that the quantum dot still only emits a single photon at a time. 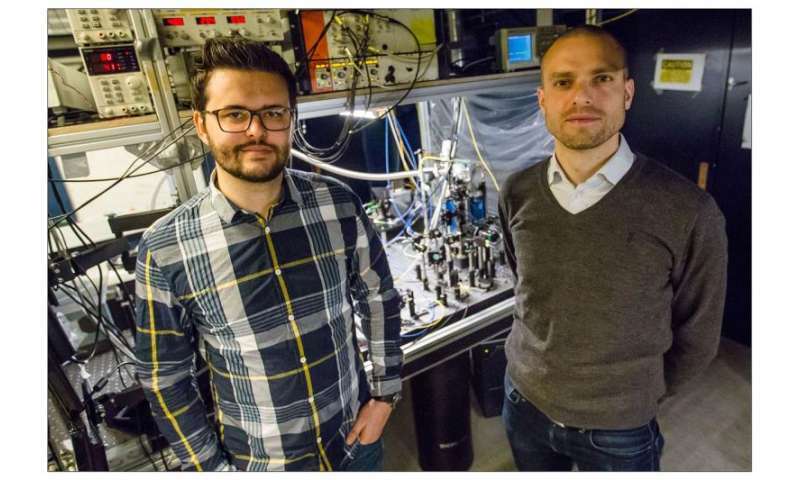 It is an outstanding single-photon source," says Søren Stobbe, who is an associate professor in the Quantum Photonic research group at the Niels Bohr Institute at the University of Copenhagen and led the project. The experiment was carried out in collaboration with Professor David Ritchie's research group at the University of Cambridge, who have made the quantum dots. Petru Tighineanu, a postdoc in the Quantum Photonics research group at the Niels Bohr Institute, has carried out the experiments and he explains the effect as such, that the atoms are very small and light is very 'big' because of its long wavelength, so the light almost cannot 'see' the atoms – like a lorry that is driving on a road and does not notice a small pebble. But if many pebbles become a larger stone, the lorry will be able to register it and then the interaction becomes much more dramatic. In the same way, light interacts much more strongly with the quantum dot if the quantum dot contains the special superradiant quantum state, which makes it look much bigger. The experiments were carried out in the group’s laboratories on Blegdamsvej in Copenhagen. "The increased light-matter interaction makes the quantum dots more robust in regards to the disturbances that are found in all materials, for example, acoustic oscillations. It helps to make the photons more uniform and is important for how large you can build future quantum computers," says Søren Stobbe. Pet peeve: The acronyms 'laser' and 'LED' already contain the words 'light'. Higher energy level is not 'up'. can be excited (i.e. jump up) Higher energy level is not 'up'. Pet Peeve: a Biologist like you, one who imagines he's qualified to critique anyone who professionally engages in any discipline such as the topic under discussion. So...yeah. I do criticize the science journalists who write about science sometimes. Deal with it. OK, i get the quantum dot "thang"; however, why not simply define every point in the field generated by all the particles in that space. Try just two types and the different possibilities. Which are calculable for whatever field. So I'm thinking your super fast light source has a simpler description. The field is updated and superposition using only two particles that may also be reduced as equal to two particles. Infinity down to infinitesimal. juz say'n simple the field is caused by the motion and the motion is caused by the field. better view in 4D, causality! Pet Peeve - being accused of being someone's sock puppet by a science wannabe who can't do the science - HeloManolo needs to stick a banana in its ear. Hey, maybe I'm antialias_physorg's sock puppet too. We both have degrees in EE. Only if you opted out of human biology prior to your EE. Why on earth would computers drive EE out of you? You must not have been doing anything significant. And you could have been there at the roots of BSD, System V, etc. Really wasn't all that significant. Fixed things. Replaced parts, etc. Didn't design anything. Didn't require EE theories or application thereof. Sad lot you have cast for yourself mate. But I suppose you are above petty organizations like IEEE. What do they possibly have to do with advanced meta-EE things you know like networking? Most modern computer problems are software error, not electrical hardware. WTF juz make up s#it! The whole article has a rather ESL Northern European flavor about it. That aside, this is an interesting development. Now, if we can get the quantum dots to be designed so they can operate in a shirtsleeve environment, and figure out a fabrication method, we've got a lead on a highly efficient light source. And as the first paragraph rather impenetrably implies, a source of photons for quantum computing and quantum experimentation.